It's nice to encourage the creation of fun, walkable urban places, but it's not always fun to walk around when it's really hot or really cold or raining outside. There's one thing the mall will always have over downtown, and that's a climate-controlled environment. 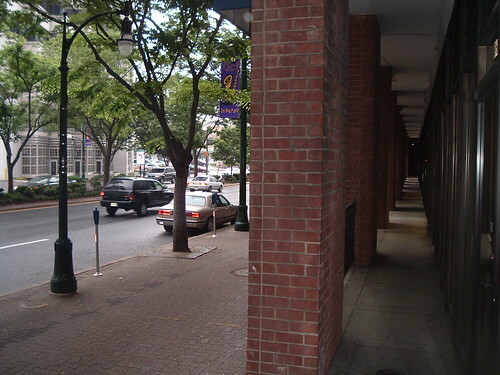 But urban places can strike a nice compromise by creating arcades, or covered sidewalks. Most strip shopping centers have arcades, like this one at Plaza del Mercado in Layhill. This is nice: you can walk here and be sheltered from the sun, rain or snow. But you can't really occupy this space. There are no benches or tables for sitting or eating, and like most shopping centers, loitering is generally discouraged. 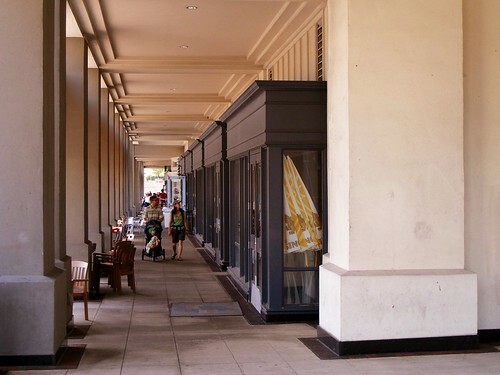 Traditionally, an arcade would cover the entire sidewalk, not just a portion of it, as it's meant to be a public space. Why doesn't it here? Perhaps zoning, or the Department of Public Works - fearful that the building would prevent them from widening Georgia Avenue in the future (God forbid) prevented any portion of the building from extending over the property line. 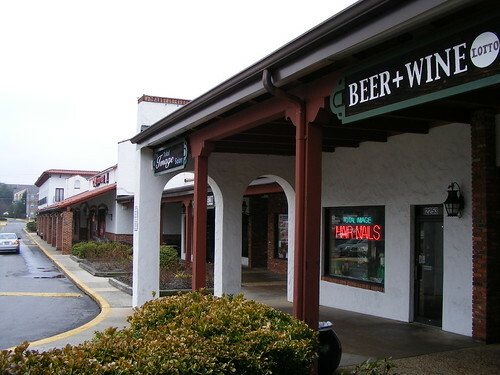 This arcade is along East Montgomery Avenue in Rockville. The building behind it houses several shops and restaurants and the Regal 16 Cinemas and, as a result, the space has lots of life and activity. It also covers the entire sidewalk, creating a sort of long, outdoor room. There's space for tables and chairs, for benches, with ample room left over for walking and window-shopping. Long before Rockville Town Square opened, this arcade became a major hangout for local kids and remains so today. The enclosure not only provides shelter from the elements, but it creates a nice, intimate space for interaction. We'd do well to create more arcades like it. This is the problem with arcades in the US, and most notably in our area, in downtown DC. Arcades do cover the entire sidewalk. You will be hard-pressed to find the type of "arcade" at the Georgian Towers in downtown Silver spring in, for example, Rome or Paris. They are used as respites from the weather, outdoor stores, markets, etc. There's absolutely no point to a 2-foot wide arcade. I should point out that while it isn't covered by the arcade, Plaza del Mercado's Baskin-Robbins has public seating and as long as you're consuming one of their products, they don't mind people sitting there. Comparably, Nopalito restaurant has outdoor seating and on weekend nights it's packed, when the weather permits. Again, when weather permits, the Starbucks and McDonalds seating areas tend to be pretty full. Of course, that is all fair-weather outdoor seating, but what sort of person wants to sit outdoors in the rain or snow? I should mention here that generally speaking, Layhill's shopping centers are pretty darn ghetto these days. It's almost as bad as Central Aspen Hill, though it hasn't sunk quite so far as North Gate Plaza, which was just abandoned by its primary anchor, Super Fresh.